DAILY SPECIALS AND CHEF FAVORITES. Welcome to The Pedaler's Pub! The Pedaler's Pub is proud to become part of the Bentonville / Northwest Arkansas community, serving hand made, old world, wood fired craft pizzas, salads, sandwiches, an all day dinner menu, and an ever changing specials menu. 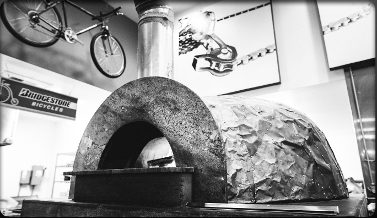 Wood fired cooking has been around since the beginning of time, and gives our pizzas a unique flavor that we think you'll love. If you've never tried a wood fired pizza, you need to come see us and taste the difference for yourself, and watch as your pizza chef prepares and cooks your pizza in old world style. Thin crust wood fired Pizza is not the only thing The Pedaler's Pub has to offer. Come enjoy our full service bar and sit out on the front or back patio and enjoy the outdoors while dining with us. Keep checking on the website for The Pedaler's Pub updated live music schedule. Our hours of operation are:11am-11pm tuesday-sunday, closed on Mondays..